Paris native Olivier Magny is a true entrepreneur. And, as a sommelier, wine educator and TV host with his own Parisian wine bar, he’s got quite an impressive wine résumé. But somehow I don’t think that’s what he really wants you to focus on. I believe his true aim is to pass on his boundless enthusiasm for the richly diverse world of wine to anyone who wants to listen, and to make sure they enjoy themselves along the way. Hence his newly released book, entitled Into Wine. It serves as a wonderful gateway into the often confusing and complex world of wine. And I recommend anyone with even a passing interest in wine to read it, and take its contents seriously. For although the book comes across as simple, there’s quite a bit of thought hiding behind its playful diction. Even so-called ‘wine experts’ are sure to find some useful information within its pages (take note particularly of the detailed appendices). 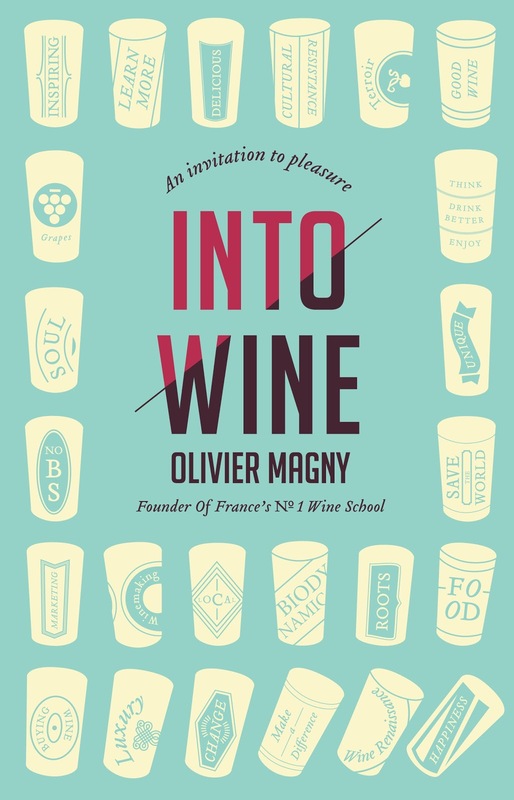 Into Wine is written in a colloquial style and broken into tasting-size pours — with interesting, and often provocative, statistical and anecdotal call-outs sprinkled throughout. The book brims with energy, enthusiasm, an unmistakable joie de vivre and a somewhat boyish sense of humor. You could say it pulsates with life. And that’s just what Olivier believes that soil should do … because this is what leads to complex, unique, interesting wines that reflect their local cultures. 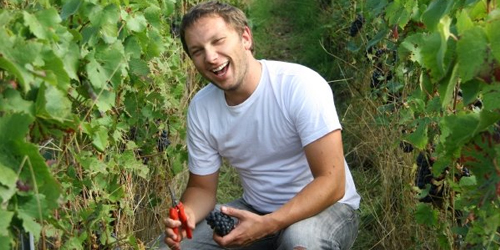 Yes, you see, Olivier is a self-proclaimed Terroirist. Now terroir is one of those French words that don’t translate well into other languages. But if you had to approximate it concisely, you could say it means “a sense of place.” And many people believe that certain methods of farming and winemaking can lead to wines that actually express the “place” they come from in your glass. The starting point for someone looking to craft such a wine (well, actually, any wine at all) is the vineyard. 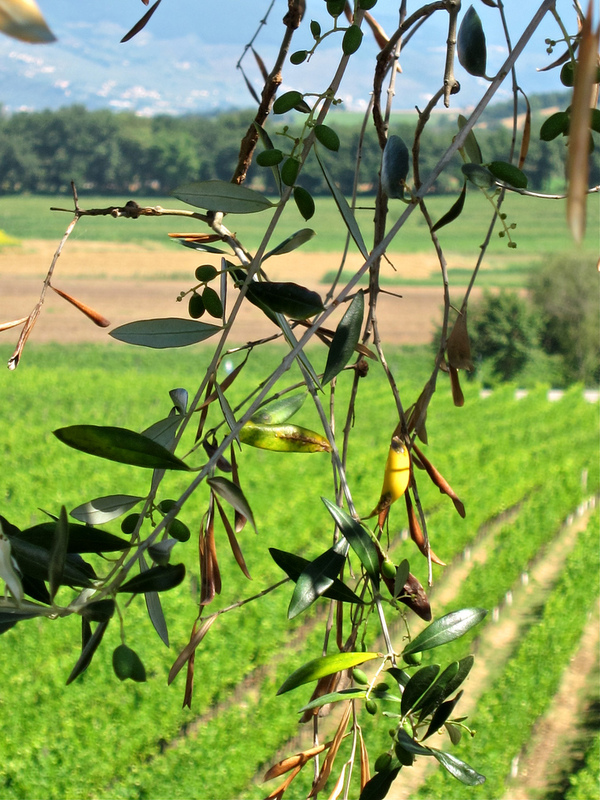 Today, there are strongly held beliefs and feelings on both sides of the fence about organic and biodynamic farming, and the so-called ‘natural’ wines that such methods often help to produce. No matter what side you tend to gravitate towards — and especially if you’ve never thought or heard about any of these things in the first place — the best policy is to let everyone have his or her own say. And that’s exactly why I asked Oliver to do via the below questions. So I invite you to listen. And if you have comments, please use the comment function below on this post or contact Olivier via his own website. Q: Why did you decide to write Into Wine and who is your intended reader? Anyone with an appetite for wine and an open mind should enjoy Into Wine. The idea behind it is not only to share knowledge and insights, but also to take a step back and look at the bigger picture of what wine teaches us, far beyond wine. Q: Your book comes across as refreshingly direct and down-to-earth, and is injected with enthusiasm and humor. Indeed, this seems to be the point: to write a wine book that doesn’t talk down to the reader or use unnecessarily flowery terminology. How do you strike the delicate balance between (a) retaining this attitude at all times, while (b) conveying what is often necessarily a lot of complex information that people will need to learn about the subject(s) at hand? Thank you very much. I’ve perfected this art for ten years at O Château. Every day, I have people in front of me that come from all walks of the wine life. Your wine pro will be sitting next to a complete novice, and my job is to make sure both have a great time and learn a lot. My daily challenge for ten years has been to strike that delicate balance between informative and fun, for everyone. Keeping things factual and genuinely helpful is as much of a requirement for me as keeping them light-hearted! The fact that both seasoned sippers and complete rookies have been raving about Into Wine tells me that I didn’t mess up completely! Q: You place huge emphasis on the notion of terroir, and the importance of becoming a ‘Terroirist’ — not just with respect to wine, but also in terms of one’s whole approach towards living. How would define the concept of terroir in its simplest form. And, if you were to distill its importance for you into five points, what would they be? Our world destroys differences at an incredible pace: the logic of terroir is first and foremost a logic of cultural resistance that fosters genuine diversity. Our world destroys our soil at an incredible pace: we need to re-think the way we farm and terroir is the most reasonable angle to tackle this fundamental issue. We are a very unhealthy crowd: exponential expansion of certain diseases and afflictions is closely linked to the way we eat and drink. Terroir helps fix that problem. Terroir gives us deliciousness — which is rather significant in my book! Terroir is about caring: for the soil, for the food, for the wine, for the ones we love. I think this whole world would be better off with a bit more TLC. Q: A significant part of the book is spent discussing “living” soil versus “dead” soil. How does this manifest in a wine (or in food that’s grown on the soil)? Wine or food made from dead soil is somewhat similar to what zombies are to humans: they’re there, but good lord are they dirty and soul-less! Q: Speaking of soil, there has been a lot of debate in wine circles recently regarding whether you can actually taste the minerals present in the soil that surrounds the vines in the final, bottled wine. What is your take, and how does this (or doesn’t this) relate to terroir? On these subject matters, I try to stay clear from all the ‘blah-blah’ and look only for the hard science. And well, current science is not conclusive on this point. What I believe in (and what science does corroborate) is that the complexity of a wine vastly mirrors the life of the soil. Does it follow that a chalky soil gives us a chalky tasting wine? Honestly, I don’t really care! What I want is for that chalky soil to be alive and well, and for the wine made from it to be delicious! Q: Let’s forget bout “minerality” for a moment. Can you describe why you see organic and biodynamic farming — not just for wine, but also for all produce — as such an important thing for the world? And can this really, as you suggest, help solve our environmental and cultural woes as well? Well, what’s for sure, and I explain why in the book, is that the status quo would lead to more famines, devastations, hurricanes and wars. So we need a new model. And I believe the best model is simply one based on common sense and empiricism. Many pioneers have been showing the way, proving to us that another model was not only possible, but also eminently viable — from an environmental, financial and cultural standpoint. The more people realize this, the closer we’ll get to getting our governments to stop rooting for toxic and destructive corporations, and to start rooting for us instead. Q: Even if the mass market of global consumers eventually decided that this was the way to go, there is the troubling issue of the economics of it all. At the moment, even middle-class people might have a difficult affording organically or biodynamically grown foods and wines (unless you think this is just an issue of priorities?). So how can this be a realistic goal for the population at large, and can this type of farming ever become less expensive than the techniques employed by ‘Big Ag’ today (i.e. GMOs and so-called ‘industrial’ farming)? When you go all the way to the ownership structure, you realize that ‘Big Ag’ is owned by the same crooks that own ‘Big Pharma’, ‘Big Banks’ and ‘Big’ whatever. We say corporations, but at the end of the day, the singular should almost apply. So what you’re looking at is a tremendously profitable business model: feeding people to make them sick while keeping them ignorant and making money every step of the way. But it’s also, and more importantly, a sickening project, if you take the time to think about it. The fact that any menu at any fast food restaurant is cheaper than two pounds of regular (i.e. organic) tomatoes is not chance; it is because one side of the system is subsidized while the other is penalized. So ‘the market’ gives us a price, and we’ve been conditioned to accept it as the reflection of a form of truth, or at least of an acceptable order of things. But then again, if we confront that with a hint of common sense, we quickly realize that ‘the market’ is full of crap. Literally. I explain in the book that so-called ‘conventional’ farming is not cheap at all and that it does not even have high yields. It simply means that each farmer will produce a lot. The fact that this one farmer is crippled with debt (often leading him to suicide), the fact that he produces toxic food (leading to exponential cancer rates in the general population), or the fact that he kills his soil (thus making future generations even more dependent on ‘Big Ag’) never seems to trouble anyone. Resistance is of course in order, and education is Step 1. Step 2 is changing what and where we buy. And if enough of us do this, then we’ll have something good going on, for the powers that be will see something that they care about: a market! And when the market is big enough: things will change for everyone. Q: There has been a lot of talk about the decline of French cuisine (with recent books such as Au Revoir to All That, etc.). You add to this general sentiment, and touch on the fact that France’s wine culture is headed seriously in the wrong direction (and fast). Why is this, and how do you think it can be reversed? France is in the eye of the tiger of the globalist project. Cultural destruction in France over the past 40 years has been absolutely mind-boggling. The loss of the wine culture is just one tiny aspect of this cultural tsunami. But I’m hopeful: some young French people are starting to get interested in wine again — though not because they love the French culture; rather instead to imitate New Yorkers! Plus French wines are going through such a phase of Renaissance right now that the French won’t be able to ignore it too long even if they tried. Q: As a Frenchman, and self-proclaimed lover of French wine, do you think the iconic wines of Bordeaux (i.e. the Grands Cru Classeés) will eventually become more terroir-driven and/or farmed organically or even biodynamically? Is this important at all? The results of biodynamic farming are obvious and the word is spreading fast throughout the world. When they refer to Bordeaux, most people actually think of the 61 Grands Crus Classés. There are thousands of wineries in Bordeaux that do not have the luxury of having the wealthiest people on earth buy their wine no matter what. In Bordeaux, change will come from below. And it will slowly but surely force the iconic châteaux to come to it. When you see the tremendous progress of Château Pontet-Canet since they adopted biodynamic farming, you can only imagine how amazing Latour would taste if they went down that road! The influential California winery Ridge Vineyards has started to put detailed labels on its wines — is this a good thing? Q: What is your stance on how wine is labeled? 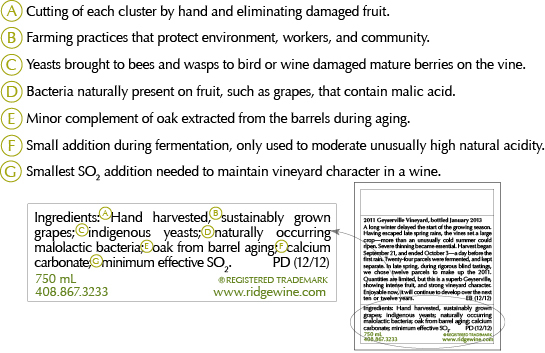 Some brave pioneers like Ridge Vineyards, for instance, are beginning to label everything that goes into their wine. Is this the way forward? I have a general uneasiness with our current reverence for transparency. If everybody does their job properly (the winery, and also the wine store), such extremes are not needed. Decency and professionalism go a long way! Q: A lot of newcomers to wine might not know how loose the rules are in US wine regions. For instance, the fact that 15% (or more) of the wine may not be the variety, vintage or region stated on the label. French AOC rules (and similar systems in other European countries) tend to be stricter. But there has also been criticism and disenchantment over the AOC system as of late. Are you a supporter of the AOC system and what do you see as its key advantages and/or failings? I think the AOC system is terrific. It fosters expression of local differences and deliciousness, while doing something we rarely do these days: recognizing the importance of our local heritage. Now clearly, out of mere coherence, the agency that regulates it needs to ban usage of many terroir-killing pesticides, and I believe it will down the road. But overall, wine producers and wine drinkers alike all much better off with the AOC system than without it. Q: For people that are just after a reasonably wine that tastes delicious, and don’t want to engage intellectually in the process of learning more about wine, what do you recommend? Do you believe that progressively drinking better wine over time inevitably leads to increased curiosity in wine drinkers, and does this really matter in the end? I’d say stop buying wines from a supermarket and start buying from a wine store instead. Then let them guide you! It’s that simple … and then, well, some people will end up becoming more well-off or more interested and will go for better wines, and some won’t. And you know what? Both are just fine! Q: Are some wines simply better than others, or is beauty (and deliciousness) in the mouth of the beholder? Q: Where can people find the best values in terroir-driven French wines? How about outside of France? In France I’d say the Loire Valley, Alsace and the Languedoc. Outside of France: New Zealand, Italy and Portugal would be my destinations of choice. But we live in a formidable period where the culture of terroir is starting to spread everywhere. It’s a very exciting time to be a wine lover! Q: You talk about how important it is for people to get out and visit actual wineries and winemakers. If someone from the US has never been on wine-centric vacation, what is the first region they should the visit — one at home and one abroad? In the US, well, I’d recommend exploring the wine regions of Oregon or Washington state. It is easier to talk to the people in charge than in California, which makes learning more fun and easier. The general vibe is a bit more rural and a bit less commercial. Abroad, well, I think Alsace is one of Europe’s best-kept secrets (especially if you like whites). Q: I’ve personally never experienced it, but many people say that certain wines give them headaches. Can you discuss the relationship between such headaches and SO2 (also the differences between volcanic S02 and SO2 that is a by-product of petroleum)? Is this what is causing these headaches? The truth is, the hard scientific knowledge regarding wine and headaches is lacking. Excess is a common cause! Now, sulfites are a common scapegoat. But you look you at it in detail, you learn that the problem doesn’t lie in sulfites, but on the one part on their origin (that should ideally be volcanic) and in their dosage. Both for the wine and for the consumer, the problem is an excess of sulfites, not sulfites per se. As a general rule, do not settle for wines that give you a headache, as headaches from wine usually stem from sloppy grape growing or winemaking (or both). I have put together a list of wineries I recommend in the appendix of the book. Readers should find that to be a very helpful resource. Q: What is the one thing you want people to take away from Into Wine? That resistance has never been so necessary, and so delicious! Q: You tell us quite about yourself in the book — but what is something that we may not know? If you want to get the book, there is a great deal if you purchase Into Wine through this link. Please note: I have no personal relationship with Mr. Magny, and in fact have never met him or been to his wine bar.